My crinums don’t look so hot right now. No problem: I simply cut off their mushy leaves and they’ll rebound pronto. Although things have been rather tame this winter, we’ve had our little cold spells. The top question goes to Daphne this week: Why do plants freeze and what will return? This annual Salvia coccinea is gone for good, unless it re-seeds in self-appointed locations! Microclimates, plant DNA, maturity, and temperature all make a difference. As we approach the last freeze date, I’ll cut back my Pride of Barbados in readiness for new growth. As Daphne says, I bet you’ve already got it: the glass will shatter. That’s what happens to plant cells as they thaw out when temperatures warm up. Some plants just lose their leaves, like this lantana. Others lose their lives, like this perennial salvia ‘Anthony Parker’. But get this: just 8’ away in the same bed, this one was fine! Since vegetables contain lots of water, a simple cover on freezing nights usually does the trick. Check out my neighbor’s hoops to elevate her row cover. They’re just plain old PVC pipes, easy to bend, but she doctored them up with a bit of spray paint! If you’re growing ‘Gold Star’ esperanza—a root-hardy perennial —you can thank horticulturist Greg Grant. His many contributions to our gardens and our libraries, like Heirloom Gardening in the South (with Dr. William C. Welch), have yet another. This go-to guide, written in Greg’s “here ya go” style, deciphers essentials from soil to planting times, cultivation, and starting and saving seeds. Arugula to winter squash, nuts, berries, and fruit trees: it’s all here, including mouth-watering Grant family recipes. Greg joins Tom this week for some tried and true tips to get you growing. He made the trip from Nacogdoches, where he’s a horticulturist at the Pineywoods Native Plant Center at Stephen F. Austin University. And mark your calendars right now for April 20, to nab exclusive SFA and Greg Grant introductions, Texas natives, perennials and more at the renowned SFA Gardens annual Garden Gala at Stephen F. Austin. It’s only from 9 a.m. – 2 p.m, so grab your wagons and get there early! It’s also a wonderful time to see the beautiful gardens. Visit www.sfagardens.sfasu.edu and click on “garden events” for a list of available plants! 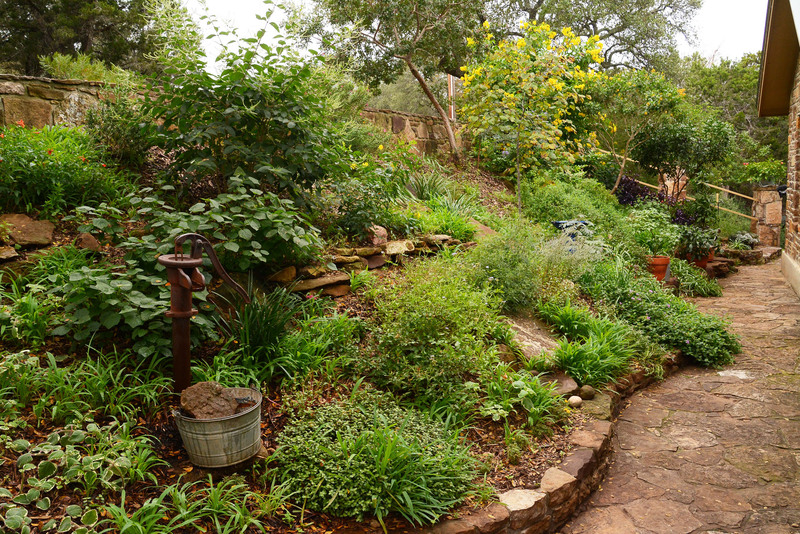 Another new Grant release from Texas Gardener magazine pulls together 10 years of his philosophical, humorous, and botanical insights from the magazine. Now in hardcover, it’s also available as an e-book. On tour, first-time gardener Ellie Hanlon teaches us a few things, too! On her blog, Mostly Weeds, follow her step-by-step process from Day 1 to irrigation how-to, including her dual valve system and fertilizer. When she first set up her garden, Austin’s water restrictions required a variance (that she posted on her fence) for vegetables. With a flick of a valve, she could turn off the drip system to her flowers. To fertilize both vegetables and ornamentals, Trisha demonstrates how to make compost tea, along with a trick using recycled nursery containers to slowly distribute it and organic granulars.